Glittering gold everything, silver sparkling accessories and a fun, fancy free attitude. 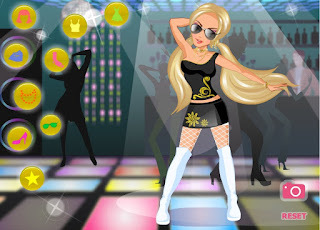 Check out this dancing diva's moves, join her for a clubbing night of wild fun! Instructions: Use your mouse to click on and through the floating clothing, accessory and make up options to style this dancing diva for a fun night of dancing and romancing.